There's so called "draw-masks" which are property-controlled switches for enabling/disabling rendering of certain scene details, including 1) scenery/terrain, 2) aircraft, 3) models, 4) clouds.This can be used for troubleshooting performance issues - you can basically toggle individual scene graphs on/off, to see if/how performance is affected.For example, if performance improves dramatically by disabling the terrain, you are mainly affected scenery complexity.Equally, disabling the (main) aircraft, will tell you if it's the complexity of the 777 3D model (cockpit). — Hooray (Nov 29th, 2014). Re: FlightGear 3.2 with B777 running extremely slow. Those draw masks will not prevent stuff from being loaded (=consuming RAM/memory), it will merely disable updates to the already loaded data. Which also applies to other stuff like aircraft.Which is why heavy aircraft like the 777-200 or the extra500 will still perform much worse than comparatively lightweight aircraft like the ufo, ogeL, santa or the default c172p (especially the 2D version is fairly lightweight). — Hooray (Jul 5th, 2014). Re: Flatland. — Jiawen (Jun 24th, 2015). Hide cockpit at Helicopter view?. I think he wants to only load the exterior model for better performance, as far as I know, there is no simple way to do that. — firefly (Dec 29th, 2015). Re: Hide cockpit at Helicopter view?. 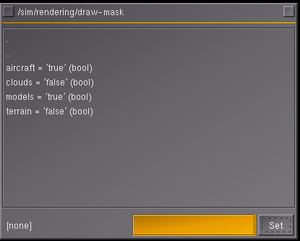 It would be possible to allow dynamic draw masks to be configured "on demand", so that certain XML/model files could be loaded into a corresponding branch of the scenegraph, so that a new draw-mask property shows up in /sim/rendering/draw-masks, e.g. /sim/rendering/draw-masks/cockpit The model loader would need to be patched to parse such annotations (e.g. XML tags/attributes) so that the corresponding osg::Switch node can be added and a visitor registered to update it based on toggling a property. — Hooray (Dec 29th, 2015). Re: Hide cockpit at Helicopter view?. Note For the time being, the Particle System does not use any of the standard Draw Masks, but a separate switch properly located at: /sim/rendering/particles (at some point, this will probably be unified by introducing an additional property and phasing out this one over time, as per ). 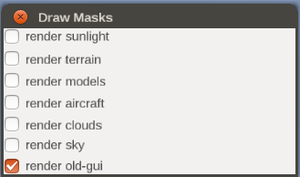 I'd like to see both LOD range and user settable masks in the .stg file. Instead of a whole new loader, I think we can just modify the existing .STG loader and ignore objects not in the draw mask? — Peter Sadrozinski (Jan 8th, 2016). Re: [Flightgear-devel] Making project3000 and osm2city part of terrasync?. we should probably consider adding a dedicated draw-mask for such features, and maybe even a "factor" attribute to specify how many of those objects/models should be loaded/shown. Maybe, there is a way to procedurally add a "marker" (tag) to each model so that the loader in fg/sg can dynamically be told to enable, increase/decrease or disable such features ? — Hooray (Nov 3rd, 2015). Re: Populate 3000 airports in one day. I agree. I think this is not very hard to implement. And I am not surprised that others had the same idea already before me. — pommesschranke (Nov 8th, 2015). Re: Populate 3000 airports in one day. My original response contains links to patches doing this - so you could basically adapt the patch to introduce a new draw-mask for autogen-based features. Feel free to get in touch if you need help with the C++ side of the draw masks - but like you say, something like that would ideally not just support on/off, but also an attribute to adjust scene complexity, i.e. scale up/down - especially for feature scaling purposes. — Hooray (Nov 8th, 2015). Re: Populate 3000 airports in one day. This page was last modified on 16 July 2017, at 11:32.